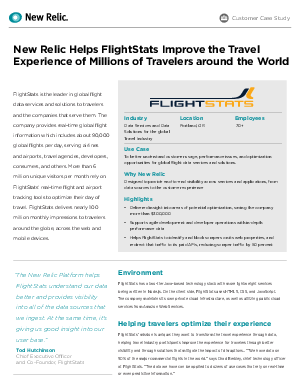 FlightStats is the leader in global flight data services and solutions to travelers and the companies that serve them. The company provides real-time global flight information which includes about 90,000 global flights per day, serving airlines and airports, travel agencies, developers, consumers, and others. More than 6 million unique visitors per month rely on FlightStats’ real-time flight and airport tracking tools to optimize their day of travel. FlightStats delivers nearly 100 million monthly impressions to travelers around the globe, across the web and mobile devices.